In anatomical position, your palms and toes point in front of your body. Your hip and shoulder joints allow you to move your legs and arms in a variety of directions. These ball-and-socket joints are the only joints in your body capable of internal and external rotation. 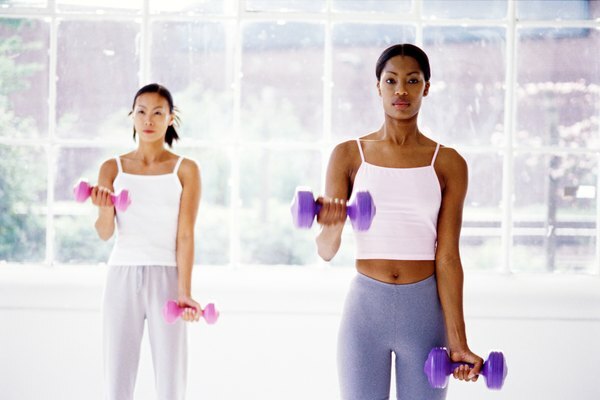 Determining which type of rotation exercise you’re performing can be difficult. The important thing to remember is that anatomical position is the basis for all movement descriptions. To place yourself in anatomical position, stand upright with your arms hanging by your sides and your palms facing forward. Internal rotation, or medial rotation, occurs when you rotate your upper arms or your thighs toward the midline of your body. For example, if you stand in anatomical position and turn your arms and hands inward, so that your palms face your thighs, you would be internally rotating your shoulder. Several muscles in your shoulder -- namely the pectoralis major, latissimus dorsi and the deltoids -- accomplish this motion. 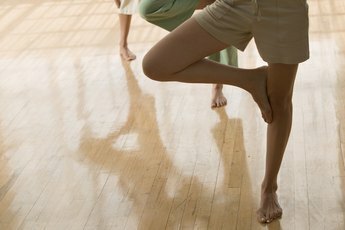 Similarly, if you stand in anatomical position and turn your legs and feet so that your toes point inward, toward the space between your legs, you would be internally rotating your hips. Several muscles in your hips -- the gluteus minimus, gluteus maximus and piriformis -- accomplish this action. To strengthen the internal rotators of the hip and shoulder, you can perform the cable-seated hip internal-rotation exercise or the cable-standing shoulder internal-rotation exercise. These exercises require you to internally rotate your hip or shoulder against the resistance supplied by the cable machine. There are other options for internal-rotation exercises using dumbbells or resistance bands -- such as the dumbbell-shoulder internal-rotation exercise or the resistance-band seated-hip internal-rotation exercise -- that you can do at home. When you work your shoulder internal rotators, you will feel the muscles on the front of your chest and shoulder contracting. For the hip internal-rotation exercises, you will feel the muscles on the side of your hip contracting. When you externally rotate, or laterally rotate, your shoulder, you turn your arm and hand away from the center of your body so that your palm faces away from your thigh, when you’re standing in anatomical position. For the hip, external rotation involves turning your thigh so that your toes point out to the side. Deep within your hip, underneath your glutes, lie the muscles responsible for external rotation. Your shoulder external rotators include the poster fibers of the deltoids, the teres minor and the infraspinatus. You can strengthen your shoulder and hip external rotators with cable machine exercises -- such as the cable-standing shoulder-external rotation exercise or the cable-seated hip-external rotation exercise -- while you’re at the gym. While at home there are isometric exercises as well as exercises involving dumbbells and resistance bands -- like the dumbbell-lying shoulder external-rotation exercise or the standing resistance-band hip external-rotation exercise -- that work your external rotators. As you perform hip external rotation, there is a contraction of the muscles where the back of your thigh meets your buttocks. When you work shoulder external rotation, you will feel the muscles on the back of your shoulder and the top of your back contract.